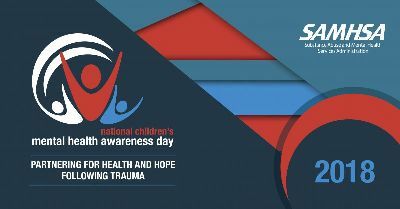 Thursday, May 10th is National Children's Mental Health Awareness Day: Partnering for Health and Hope Following Trauma. This year, efforts are focused on highlighting an integrated health approach for addressing the mental, emotional, and physical health needs of children, youth, and young adults who have experienced trauma. These traumas can range from physical abuse, sexual assault, loss of a loved one, to bullying and more. Trauma can occur in many different forms and understanding how to cope with each of them is difficult for children to process, understand, and accept. Since suicide is the second leading cause of death in youth ages 10-24, it is important that we address this issue and reach out to children and young adults to get them the help they need. What is a Serious Emotional Disturbance? There are many ways to talk about behavioral, emotional or mental disorders. All of these disorders are considered a Serious Emotional Disturbance or SED. The Individuals with Disabilities Act defines a person with a SED as a person exhibiting one or more of the following behaviors over a long period of time and to a degree that it adversely affects the person’s performance. Children may suffer from an SED and that can go unnoticed because it is automatically dismissed as them “being a teen”, dealing with hormonal changes, immaturity or just “being a kid”. When it begins to affect their life’s direction or momentum, it’s already past the time that we need to reach out, step in and find them the help that they need. Help can come from family support, but in many cases, it’s time to seek medical guidance, counseling, therapy and in some instances, medication. Any of these signs, especially if they occur after a known trauma, may indicate a child needs help. What Can Parents or Caregivers Do? Listen to what your child has to say. Often our job is to do more listening than talking. If you have questions about childhood trauma or mental health concerns, give us a call. PORT Health works to improve the lives of children and adults by offering a comprehensive range of services including treatment options for kids who have suffered a trauma. We believe with quality therapeutic interventions, children/adolescents are able to develop the coping tools and life skills needed to acquire the highest level of functioning possible. If you or someone you know needs help overcoming a mental or substance use disorder, please call us today at 252-830-7540.